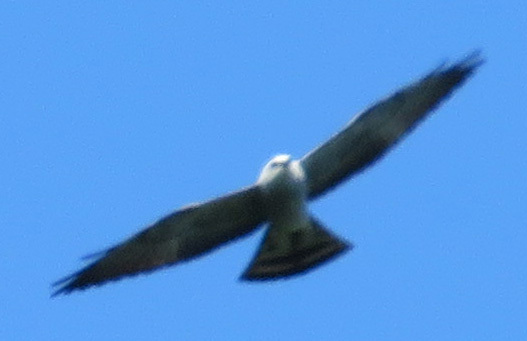 On a Thursday afternoon, I saw Mississippi Kites flying over. These birds are one of the easiest for me to identify even though they fly high up, because their silhouette is so simple and sleek, as if a minimalist drew a raptor. The next day, I saw all three of these other raptors! Turkey Vultures I see almost every day (and Black Vultures too), but this one hung in the air on a head wind, so I got a better picture than normal. Turkey Vulture. I lightened this one a lot, to show the rows and rows of feathers on its wings. And I don’t know why, but in all the pictures of this bird, it’s like you can see right through its skull in the eye area. 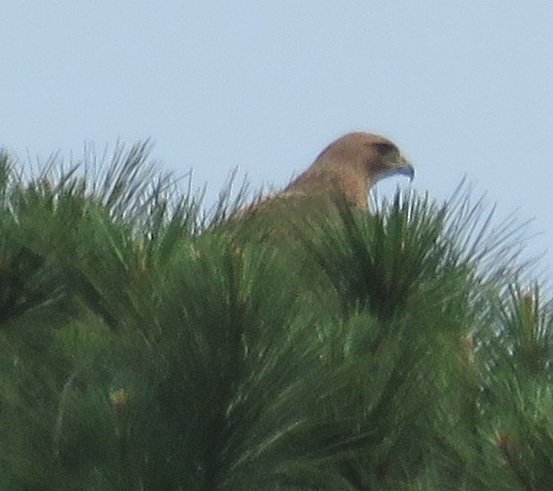 Then I saw this hawk fly across the field and land in the very top of a pine. I am pretty sure this is the Red-tailed Hawk who has been hanging around. Is there a nest up there? And as we completed our walking loop, I saw this Red-shouldered Hawk fly up and land on a branch. Red-shouldered Hawk. 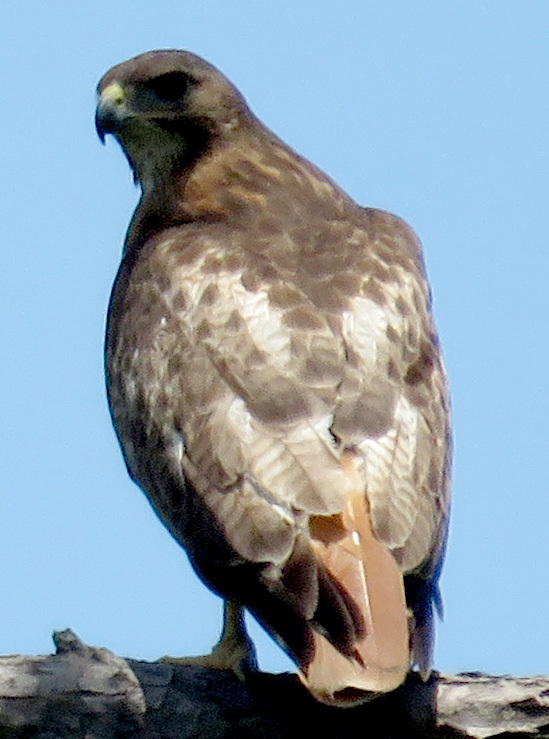 This is the most common hawk year-round in our area, but I usually only see them 4 or 5 times a year. Then a few days later, the Red-tailed Hawk flew right past me too. A few days later, he/she dropped by to show off the new red tail that is growing in. When last we saw it, there was one red feather overlaying the juvenile striped tail. We have also had some Broad-winged Hawks around within the last month. With all these different raptors, I got to wondering how they co-exist and divide up the territory, so I read a little about their diet habits. Turkey Vultures of course are after carrion. Mississippi Kites eat mostly dragonflies and cicadas, but they seem to stay so much higher up in the air than I ever see those insects, I’m not sure what they’re catching around here. 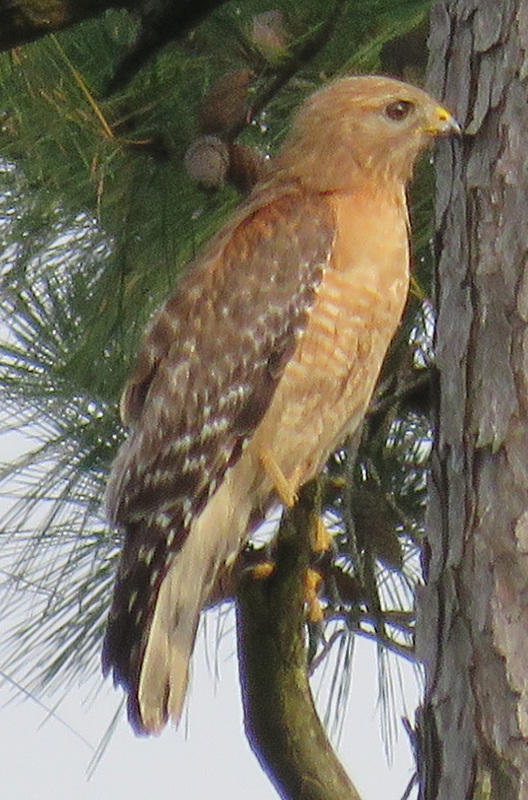 That would leave Red-shouldered Hawks, Red-tailed Hawks, and Broad-winged Hawks to compete with each other. They are all buteos with broad wings and the characteristic behavior of soaring on updrafts of warm air. All of them practice the Perch-Watch-and-See-What-Turns-Up philosophy of hunting. The Broad-winged Hawk is comparable in size to a crow, so it is looking for small prey. The Red-shouldered Hawk perches and hunts below the forest canopy, and the Red-tailed Hawk also practices the hunt behaviors of soaring, kiting, and hovering. I got all of this information from The Behavior of Texas Birds by Kent Rylander, which is a book I recommend even if you don’t live in Texas. The way he explains how the bird’s physical traits affect its behavior and vice versa is like no other guide book I’ve read. His summaries of behavior patterns makes it easier to keep all these birds clear in your mind. As with a lot of my observations, I’m not sure if there are really more raptors here than usual, or if I’m just noticing them more. Beautiful birds and yes,, I’ve seen the red-shoulder hawk. 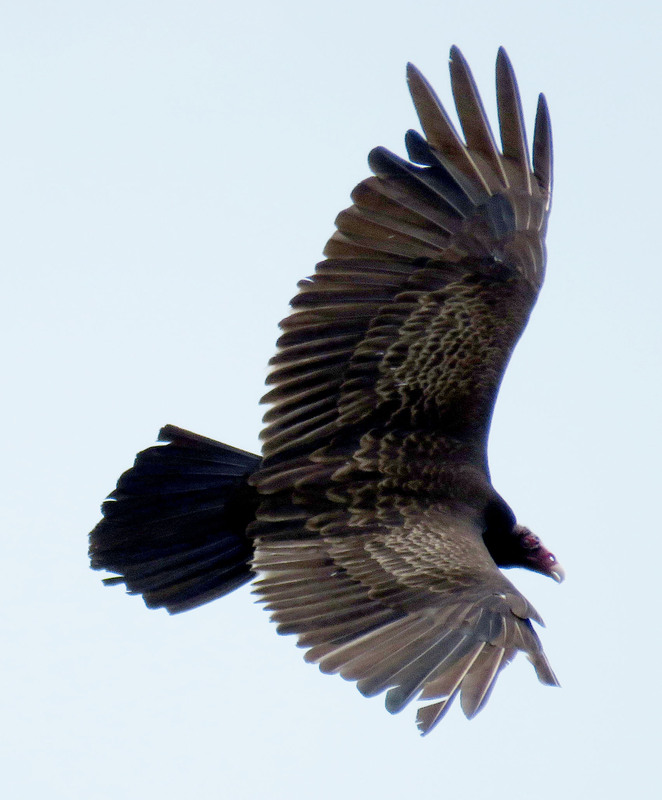 Don’t think I’ve seen a Mississippi Kite though…plenty of turkey vultures. Most times when I’m out in the car I always see a red-tail sitting atop a tree, telephone pole, etc. So easy to spot these days. I don’t see red-tails here very often. I know they are fairly common so I am probably just not spotting them.